The most popular valley of Himachal Pradesh is Kullu Valley. The Kullu word was used in ancient times as Kullut or Kulant Pitha, the end of the world. Taking from the old Hindu epics the Seventh Manu has come to the valley where he has saved all species of the world creature. One of the prettiest valleys Kullu valley is full of pretty places, historic destinations,tourist destinations.The valley is been blessed by the nature with small beautiful valleys,roaring rivulets. Waterfalls,grazy grounds,thick forests are all parts of this valley beautiful. Kullu valley is called as Beas valley as the river Beas fed and vegetate the valley. Kullu valley attracts tourist crowd very heavily. The climate of the valley is also favourable to the visitors. The healthy atmosphere of the valley makes tourists attraction for the region. Kullu town is the centre of valleys business market and Manali is the centre of valleys tourist market. Being easily accessible by all means of transport everyone can visit Manali. The small airport at Bhuntar has raised new air transport facility for the region. The valley has consisted some of very fine visitors,pilgrims destinations and some very popular fairs. Manali, Rohtang pass, Kullu are one of them. Kullu is been described in Indian epics as the region is was once resided by Pandavas at the time of their Exile. Also even before that the place is been said to have once visited by Manu the father of humanity. Later Kullu is approached by Mauryas and Buddhism is been spreaded over the region. Some description is been found of Mughal time also that the region was conquered by Mughals from the local kings, Sikhs history is also associated with the valley. After independence there’s been major change is infrastructure field as the area has become approachable for outsiders by the means of transport. Kullu valley is situated in the lap of The Himalayan Mountain range. The wide vegetated region is formed by river Beas. The valley is accessible through different locations. It can be reached from Kangra via Jogindernagar, from Shimla via Siraj and from Chandigarh and plains via Mandi. The nearest railtrack is at Jogindernagar and nearest airport is at Bhuntar. The valley is approached via NH 21 which surpasses from Chandigarh to Manali.The Vegetated valley consists of variety of forests ,orchids and wildlife. The waterwealth is also very rich in the region. The main river Beas and many other rivulets,waterfalls and small lakes are the part of natural wealth of the this rich valley. Being blessed by the supreme nature the valleys nature is protected by The Himalayas. The weather and climate has directly been affected by the high mountains of Himalayas. The rivers are fed by the big glaciers of Himalayas. The breeze temperature remains always on lower side due to all time snow covered peaks and mountains. The evergreen forests of Pine,Devdar, rhododendron and Ban covers major forest land. The valley is full of flora and fauna. The rich wild life has enshrined some of rare wild animal species like Himalayan Tahr, Western Tragopan, Monal and Himalayan brown bear. The valley is visualising more and more tourists year after year. This is also because of variety of nature of the valley, culture ,nature and different adventure activities which attracts everyone to the beautiful valley. Most of the tourists wants to visit Manali at least once. The natural beauty of Manali spontaneously attracts the wanders. Manali is also the centre of all adventure and winter sports activities. For tourism point of view all sports,trekking or mountaineering facilities are provided at Manali. So Manali makes itself a complete and ideal tourist place. Kullu valley is not only Himachal’s but this is one of the most popular valleys of India. There are numerous tourist destinations. Picnic hotspots,sports centers,trekking routes, adventure spots makes the region famous among nature lovers. Some of them are Solang Nala, Malana Village, Kasol, Bhuntar. Rohtang Pass,Marhi,Manikaran and many other small pretty destinations. The valley is full of hot spots where visitors can spend their time with nature. Kullu valley is popular for the adventure activities in the region. Say it paragliding and skiing at Solang nala. Mountaineering and trekking in the peaks of valley. White water rafting on the slopes of river Beas all activities are popularly exhibited. Kullu Dussehra is one of the international fair celebrated at Kullu town. The renowned festival attracts people from all over the globe. Everyone can see the glimpse of the regions values,culture and traditions. The local lord idols comes with their followers to celebrate the Raghunath Yatra on Dasara day. The festival is always been in curiosity for visitors. 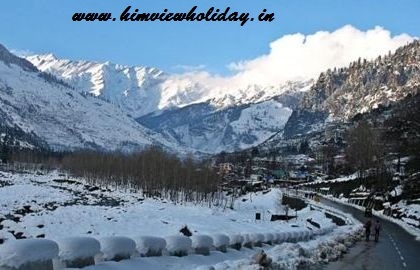 Himview Holidays provides exclusive packages for Kullu valley. Our Kullu Manali tour package is one of the popular packages. Our popular tour packages are Shimla Manali tour package, Manali tour package,Manali winter tour package, Manali honeymoon tour package all going through Kullu valley. Shimla tour packages, Shimla winter tour package, Kinnaur tour package, Kinnaur spiti rohtang pass tour package, Dharamshala tour package and Dalhousie tour package.